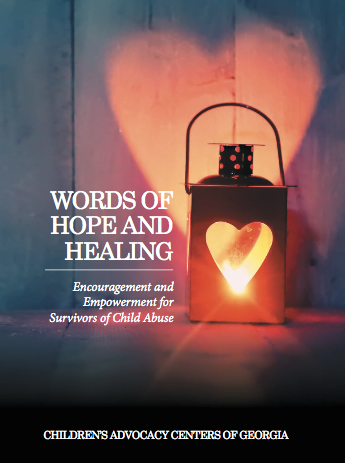 Directors in the Children’s Advocacy Centers of Georgia state network of CACs have collaborated on a book certain to provide words of future hope and healing for the courageous children who have been victims of childhood sexual abuse, physical abuse, neglect, or exploitation. Indeed, anyone who has experienced a traumatic event, or have been the loved one of such a person, will find value and meaning to the thoughts and messages inside this book. Our mission is to be, now and always, for the children. Please see the price description below for pricing information, including the additional discount for purchasing 60 books or more. The Children’s Advocacy Centers of Georgia is pleased to offer special pricing of up to 30% off of the retail price to our colleague CACs across the country. Depending on the number of books order, each copy will be as low as $14.00 per book. In order to take advantage of this discount, the online order form must include the name of the affiliated CAC and a contact person from the ordering CAC. Orders must be placed in increments of 20 books. The price per book for orders of 20 books or 40 books is $16.00 for each book. The price per book for orders of 60 or 80 books is $15.00 per book. For orders of 100 books or more, the price per books is $14.00. For all orders, FREE UPS Ground Shipping applies. Please use this chart to determine costs. When ordering, note that entering a quantity of “1” will order 20 books, “2” will order 40, and so on up to a quantity of “10” for 200 books. For orders of more than 200 books, please contact our office directly.